Acute versus chronic activation of microglia in AD. Aβ binds to PRRs, leading to activation of resting microglia. Acutely activated microglia express cytokines, which drive enhanced phagocytosis, uptake, and clearance of Aβ. Long-term activation of microglia drives proliferation as well as a chronic inflammatory state that causes neurotoxicity and neurodegeneration. 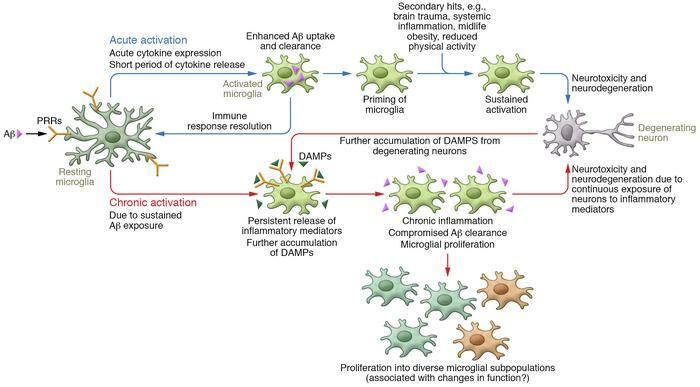 Sustained activation of microglia, induced by brain trauma, systemic inflammation, obesity, and reduced physical activity, also drives neurotoxicity and neurodegeneration. DAMPs that arise from these processes further activate microglia, leading to compromised Aβ phagocytosis and propagating chronic inflammation. Chronic inflammation and accumulation of Aβ are well-established clinical features of AD.